Today marks Dan’s 32nd birthday. In his family, birthdays were never really a big deal–but not in mine. Birthdays were big events, and I haven’t let that little tradition fade in my family either. I remember when I was little birthdays meant getting to ride in the front seat of the VW bus all day, choosing your dinner fare and activities for the day (my standby was always the aquarium with Ben and Jerry’s afterwards), being excused from the dinner dishes, and staying up as late as you wanted. But since riding in the front seat is a given, work is required, and staying up late would be far from a gift, we’ll shower Dan with a few carefully crafted and purchased presents, a good meal, and party hats. This afternoon the girls and I worked on another sets of these tees for Dan. This will be his second set, the first was for last year’s father’s day. He has worn them so much they are starting to fade and when I washed one of them the other day, I couldn’t believe how teeny-tiny their handprints had been. 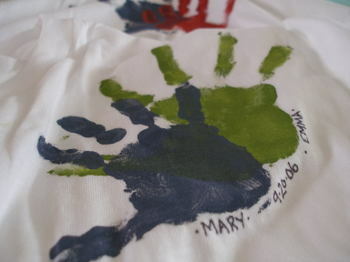 Mary was an infant and her handprint was really no more than a smear. I remember there being more paint on her onesie and chin than on the tshirt. So this year a new set was definitely due. Just a few weeks ago, I asked Emma what her favorite thing was about living in Wisconsin. She told me, "painting tshirts for Daddy." (Huh?!) I figured we could paint tshirts in Maryland, too. Funny what kids remember. So, tonight we’ll eat grilled steak and the official Maryland state crustacean, then nibble on a few pink-frosted cupcakes with sprinkles (whose birthday is this!!? Funny how the birthday becomes as much about the kids having fun as it does celebrating Dan’s birth. ) And we’ll open one or two other gifts. sounds like the perfect way to celebrate! enjoy! oh, how sweet! Birthdays should be celebrated and your plans sound perfect. The handprint shirts are great. And pink frosting! he he he. love it. Happy Birthday Dan! Sounds like a good birthday to me! Best wishes! Happy birthday to Dan! What a good daddy, wearing the handprint T-shirts until they faded! Enjoy the dinner and cupcakes. I hope he has a fantastic birthday but how could he not spending it with all his girls! Sounds like a great plan. Happy birthday Dan! I LOVE BIRTHDAY! 🙂 Have fun dan 🙂 Happy birthday! Sounds like you have a great b-day planned. Happy Birthday Dan! Enjoy your celebration! Happy Birthday Dan! What a lucky guy! Happy Birthday, Dan! Happy belated Birthday Dan! Peter has one of those T’s decorated by Emma when she was about 3, perhaps its time for a new one, thanks for the inspiration Molly. in our family too the birthday person chose the dinner menu and there was always chocolate cake and a home party with a mega treasure hunt. Happy Birthday Dan! Love the t-shirt hand prints. the t’s are adorably cute…what a sweet idea. My husband and I have exactly the same birthday dynamic as you two. I had parties with lots of games and they were always big affairs and he or his siblings never had a party and they were always low key. Suffice to say I have taken over the birthday traditions in my house too! Birthdays should always be a very big deal if you ask me – no matter how old you are!